It’s time. It’s time to stop slipping into an employee mindset and playing it safe in your business. We have built up this idea in our minds that being successful means safety, leaning into dependability, and having trust in a “sure thing.” What if I told you that fulfillment and success wait on the other side of those scary leaps you need to make in your business? The trust you’re placing in your upline, in your network marketing company, in the product you sell, it could all come crashing down tomorrow. However, when you build security in yourself, instead of relying on the “safety” offered by others, there’s no need to fear any of that, because the world could topple, but you would stand tall. The first step towards fostering a sense of security in self is identifying whether you have an employee or entrepreneur mindset. Employees depend on others to guide the way to forward movement in their business. Entrepreneurs are consistently thinking about what they need to do to make their business successful. If you are constantly looking to your upline or your husband, or anyone else to tell you what to do next, you may be stuck in an employee mindset. If you want to become a leader in your industry, you have to stop relying on the check-lists other people are making for you. Entrepreneurship is a risk, but it isn’t a gamble. The biggest accomplishments that yield the greatest results all come with the risk of failure. To avoid failure is to remain small and relatively ineffective. It can be scary to take the risks needed to build your business. However, when you begin to build security in yourself, the wheels could fall off of your business, but you’ll fail forward. Each failure becomes part of the foundation that will build your legacy as a leader. This may seem counterintuitive but, to get out of an employee mindset, and build security in self, you may need someone to help. Find the dreamer in your life that will help you give shape to your goals. Dream about the future, and then reverse engineer the process. Entrepreneurs look towards the future and begin with the end in mind. “You cannot expect to get very quick, sustainable results early on in your business. You’re going to build value and teach people what you’re about and build a brand, and that takes time. This week, take some time to reflect. Have you been operating from the mindset of an employee or an entrepreneur? Identify a small risk that you are willing to take. It may be scary, but this is the best way to begin to build confidence in yourself. Don’t hesitate. Take action quickly. And remember, you aren’t doing this alone. Join the Authentic Influencer group on Facebook, and surround yourself with a group of women who are growing security in self, and mustering the courage to take those risks. 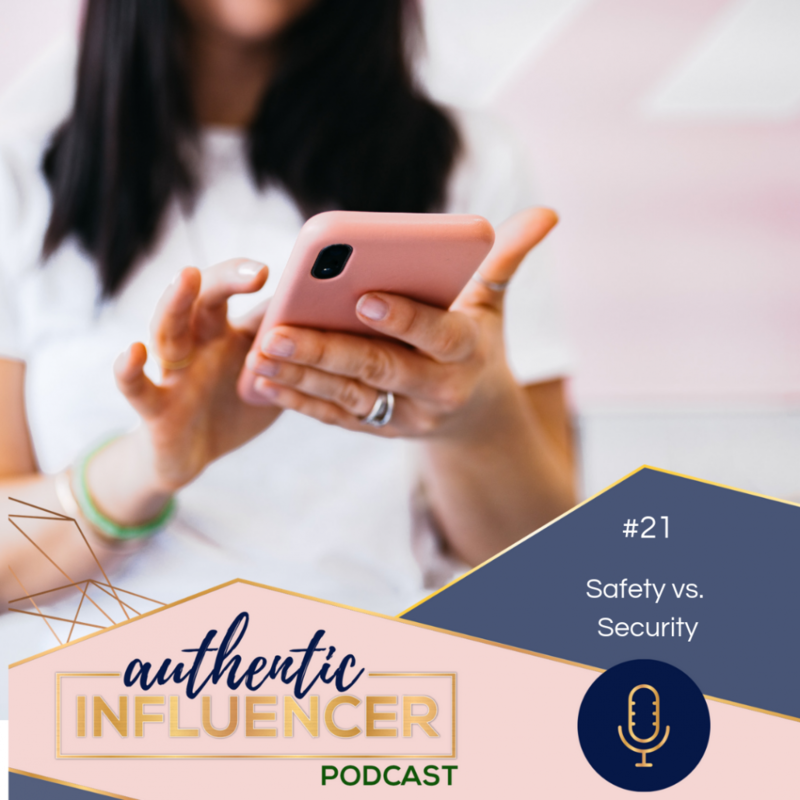 Find the “Episode in the Topic” section of the group and leave a comment sharing the risk you are taking to start moving from safety to security!